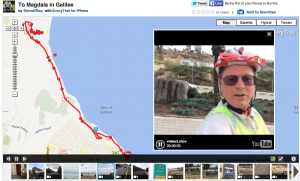 Our group just arrived in Galilee and I jumped on my bike and took off for exercise and adventure. The Legionaries are building a “Spirituality Center”, whatever that is, at Magdala so I am off to check it out. I’ve been told they built a Protestant chapel there so I have to see this with my own eyes. Both of these issues are a problem for me. Why not call it a Catholic Church? What is a “spirituality center” anyway? Any what is a Protestant Chapel doing in a Catholic establishment? Here we will soon find female Anglican priests with their lavendar shirts and “priest collars” along followed by Pastor Billy Bob preaching “faith alone” and the “Bible Alone” while unsuspecting Catholics are celebrating Mass above them. Hum? There were other fun things along the way too, like camels and goats, big puddles flooding the street and more. Enjoy this multimedia trip with story, video and pictures.